Japan is comprised of mountainous, volcanic islands with less than 20% arable land. Since Japan's staple food for more than 3,000 years has been rice, building rice paddies by terracing the mountain slopes was once essential to maximizing food production. 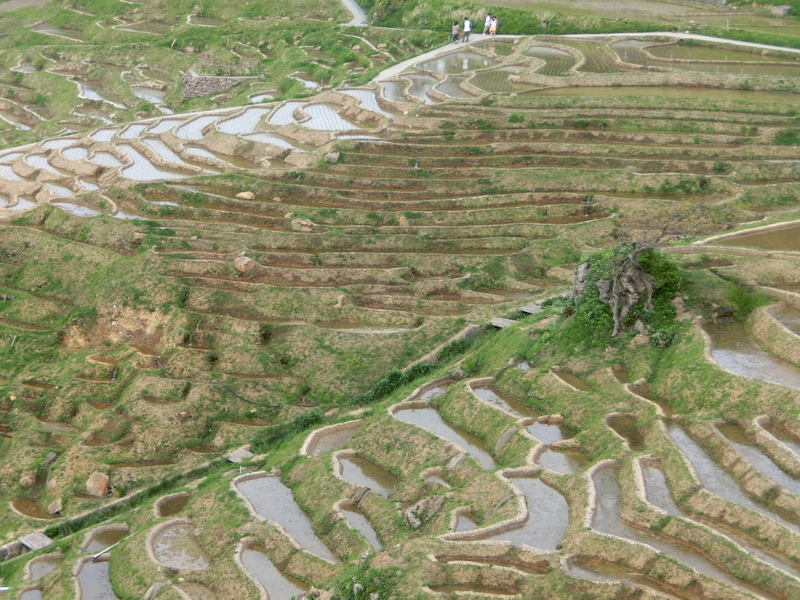 While these terraced paddies are often small and therefore difficult to cultivate using modern machinery, there are still several areas in Japan where local farmers are using them. They are not only productive, but scenic as well. Where large numbers of terraced rice paddies cover a hillside, the area is known as tanada (terraced paddies) or senmaida (a thousand rice paddies). Many are quite remotely located, so that visiting by car is advised, but some are accessible by public transportation and recommended to the intrepid tourist looking to see the essence of "old Japan". Below is a sampling. The Oyama Senmaida are located in Kamogawa, making them accessible as a day trip from Tokyo. Although there aren't actually 1,000 rice paddies here (apparently the number is closer to 350), it's one of the largest networks of rice paddies this close to Tokyo. The 800-year-old terraces have also been designated as a Chiba Prefectural Landmark and as a "cultural landscape." 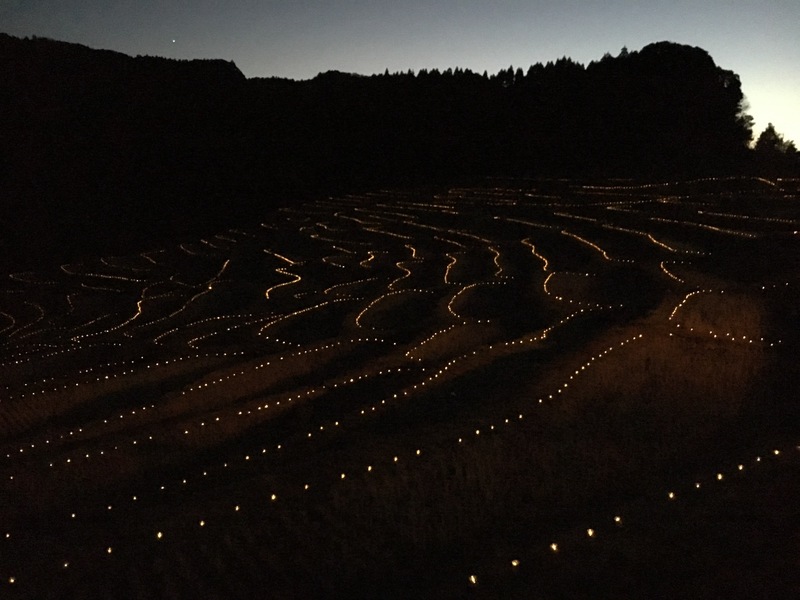 Perhaps because of these designations and the proximity to Tokyo, the local community that manages the paddies hosts a number of events throughout the year to keep the area interesting to tourists, including a winter and late summer light up using small solar-powered lights placed on the edges of the terraces. It is quite soothing to watch the twilight fade as the solar lights get stronger bringing the terraces into relief. Other events include indigo dyeing, mochi (rice cake) pounding and paper-making. Access: An easy drive from Tokyo, especially using the Aqua Line tunnel. To use public transportation, take the JR Sotobo Line to Awa-Kamogawa Station. From the east exit, take the bus bound for Hiratsuka Hongo and get off at Kamanuma (20-30 minute ride). From there it's about a 20-minute walk. 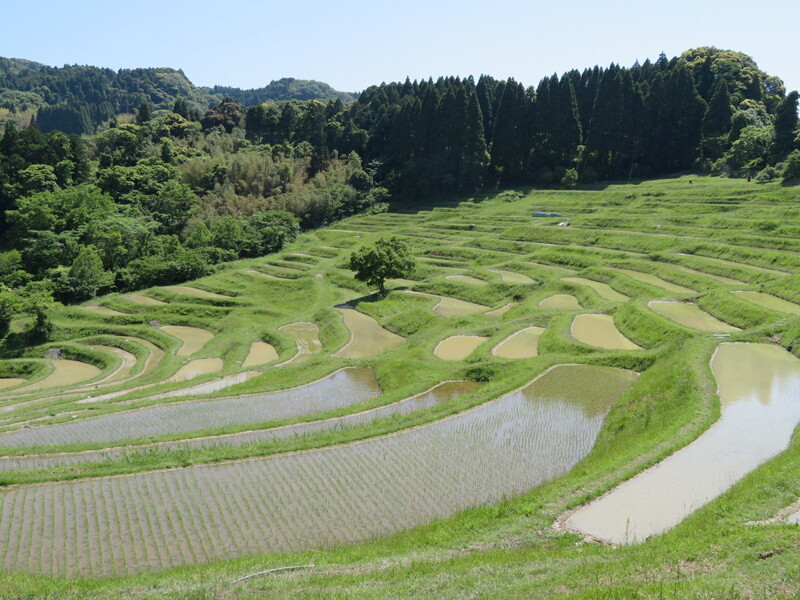 The Shiroyone Rice Terraces are a highlight of Ichikawa's Noto Peninsula. Here there are actually 1,000 (well, 1,004, to be precise) paddies, mostly running down the steep slope between Highway 249 and the Japan Sea shoreline. It is a dramatic sight in any season, but is apparently most popular during its winter light-up (mid-October to mid-March), when the tiny paddies are rimmed with solar lights that change color every 30 minutes. 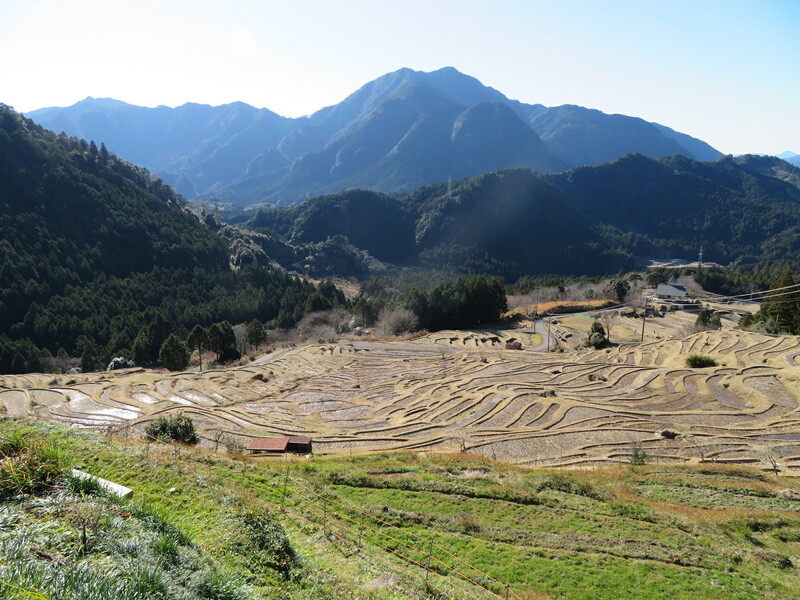 This network was predominately developed in the 17th century and doesn't seem to have fallen out of use as much as some other terraces in more remote parts of Japan. It is part of the Noto Peninsula's agricultural system registered with Globally Important Agricultural Heritage Systems, which is administered by the Food and Agriculture Organization of the United Nations. Access: Easily accessed by car from Kanazawa or Wajima, but there is also a bus: the Machino Line, Hokutetsu Oku Noto Bus from Wajima; get off at Shiroyone (30-40 minutes). Deep in the mountains of southern Mie Prefecture, yet just a dozen kilometers from the west coast of the Kii Peninsula lies the Maruyama Senmaida. This network of more than 1,300 rice paddies was built on the steep mountainside over a period of 400 years. According to local records, in the 16th century, there were more 2,200 paddies. Some of the paddies are so small that a local legend tells of someone who once counted them, came up one short, and found the missing paddy under an open umbrella. By the 1990s, this senmaida was down to just 500 paddies in cultivation, and then local preservation efforts began. Local events such as a planting festival in May and a "send away the bugs" dance in July (including evening illumination) help attract visitors. During my mid-winter visit, plush mannequins in various costumes were posed around the paddies. Access: This is quite a remote location, best reached by car (don't use the Tripadvisor map--you'll end up in the wrong place). There is a bus from Kumano-shi Station (bound for Seiryu-so Onsen; get off at Senmaida/Toritoge-Iriguchi and walk 30 minutes.) Although there is a small parking area/viewing platform near the top, there are no other amenities, making this a great spot to pack in your own picnic! 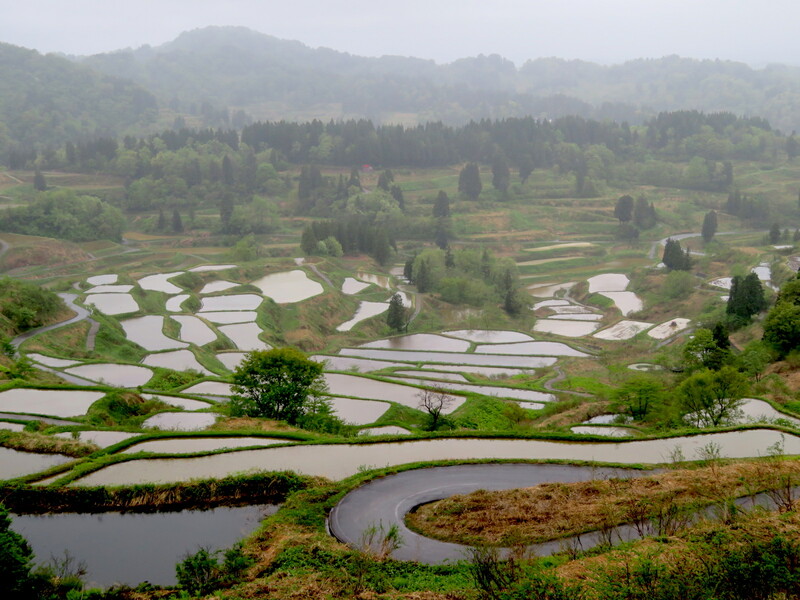 For a truly remote collection of rice terraces, try Hoshitoge, nestled in a steep valley in Niigata. Although this landscape seems to have been re-contoured, with small paddies consolidated and reshaped to allow for mechanical cultivation, the setting and expanse of the paddies is still spectacular. Like many terraced rice paddies, the "mirrors" created by the flooded paddies are among the best scenes to behold. Niigata is known for its heavy snows, making these paddies all but inaccessible in winter. In the other seasons, however, there are small parking lots for cars and tour buses (and even toilet facilities) at the top. Access: Hoshitoge no Tanada is sufficiently remote that local tourism authorities don't recommend using public transportation to reach it (although there is a Tokamachi Community Bus that runs from Matsudai Station to the village of Hoshitoge; it's probably a 20-30 minute walk to the tanada from the village bus stop. Tourists using public transportation are recommended to take the train to Matsudai Station and take a 20 minute taxi ride from there. It is about an hour's drive from the city of Tokamachi. In a system similar to the garden allotment system many cities have for vegetable cultivation, many senmaida offer the opportunity to become an "owner" (well, really it's more like adopting a rice paddy). Oyama, Shiroyone and Maruyama all have owner programs. To participate in most owner programs, the annual fee is 30,000 yen per 100 square meters. The cultivation activities are organized/managed by a local trust or NGO, so all you have to do is show up and help. In fact, if you can't make it, others will do the work for you based on your financial support. As an "owner", you're entitled to the rice produced by your paddy. Depending on the location the yield ranges from 10 to 40 kg of rice per year. It's a great way to get non-farmers more connected to the land and more aware of what's involved in rice production, but even more so a great way to ensure the preservation of these beautiful agricultural systems. After all, rice paddies don't just happen. Their edges have to be carefully created with wooden frames covered with clay soil (finding remnants of these wooden frames is often the clue archaeologists need to identify ancient settlements). The paddies need to be nearly level in order to be properly flooded, and they are often constructed in a network so that water can flow downward from one paddy to another, perhaps a reason why mountainside terracing was once so popular. The entire system has to be regularly maintained and is often repaired in the spring before planting time. It's a lot of work and increasingly when driving through the countryside one sees abandoned rice paddies, or even former rice paddies that have been covered with solar panels to make them energy fields instead. It is often said that wet paddy rice cultivation, and particularly the cooperative work it required historically, was the driving force that shaped Japan's culture, values and society. Indeed, rice is so ingrained in the Japanese diet that the word for steamed rice, gohan, is often used to mean "meal". Standing at the top of a cascade of terraced rice paddies, irrespective of the season, one can truly appreciate the significance of this amazing food and what it takes to produce it. I've been to the Shiroyone rice paddies in Noto. They are picturesque and photograph well, but cover an area that is 200m by 150m in size. They are tiny compared to cascading paddies in other countries, such as the Bontoc area in the Philippines. Until the 1970s, many paddies in the mountains in Japan were on contours of the land. They have since been bulldozed into large squares to allow the use of tractors and other machinery. If you take the train to Awa-Kamogawa, check the timetable. There are not many trains. The Wakashio limited express is comfortable and much faster than the slow trains. You will save over an hour on the journey. Be warned that the Wakashio leaves from the Keiyo Line and is at least 10 minutes walk from anywhere else in Tokyo station.